When barrier protection is essential, TigerPak is your resource. As one of the nation's largest distributor of flexible preservation packaging, we have the experience needed to develop a package that meets your precise requirements. In addtion to roll stock laminate film, we offer three types of custom pouches: VaporFlex ®, Vapor-Loc ® and gusseted stand up pouches. Call our expert Customer Service representatives to discuss your needs. 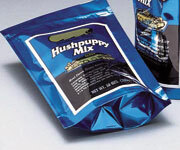 VaporFlex ®, a non-zippered barrier pouch constructed to keep moisture levels constant. Vapor-Loc ® combines the security of a barrier pouch with the ease if a reclosable zipper. 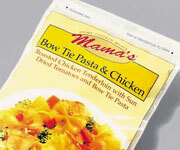 Stand Up Pouch: An attractive barrier pouch with a gusseted bottom, perfect for shelf display. 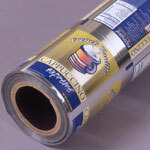 Roll Stock: solventless laminated barrier film for bag and pouch forming. Applications: For seeds, food, pharmaceuticals and electronic components. Construction: Top heat seal and heat sealable open bottom for insertion of product. Custom options: Specify size and select from a wide range of materials in two to four layer laminations. Print in up to six colors on both sides. Tear notching, hole punching, eyeletting and continuous web stock available. Construction: These laminated preservation pouches have a top seal that alerts customers to tampering, and a Loc-Top ® zipper that offers convenient, frequent package reuse. A heat sealable open bottom facilitates packaging multiple pieces, powders or liquids. Custom options: Specify size and select from a variety of laminates. Print pouches on one or both sides in up to six colors. Hang holes and tear notching available. Construction: Top heat seal, gusseted bottom, with resealable closure available. Superior burst and drop strength for easier handling. Custom options: Manufactured to your specifications in custom sizes from a range of laminates. Print four color process or up to six match colors. 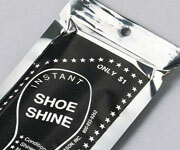 Tamper evident seals, zipper closures, and tear notching available. Construction: Film-to-film: clear, opaque; metallized; film to foil; paper to foil. Custom options: Slit to width, in a variety of laminates with flexography printing up to eight color process.